I've been trying to cram in as many 5ks as I can this summer because it is soooooooo hot and I work all day in the sun, which makes it really hard to convince myself to go out and run. At least with races, I won't back out. Anyways, I went searching for a 5k for this weekend a while ago and came across the Boring Runner's 5k. I've never seen his blog before, and the race looked like a lot of fun, so I signed up immediately. 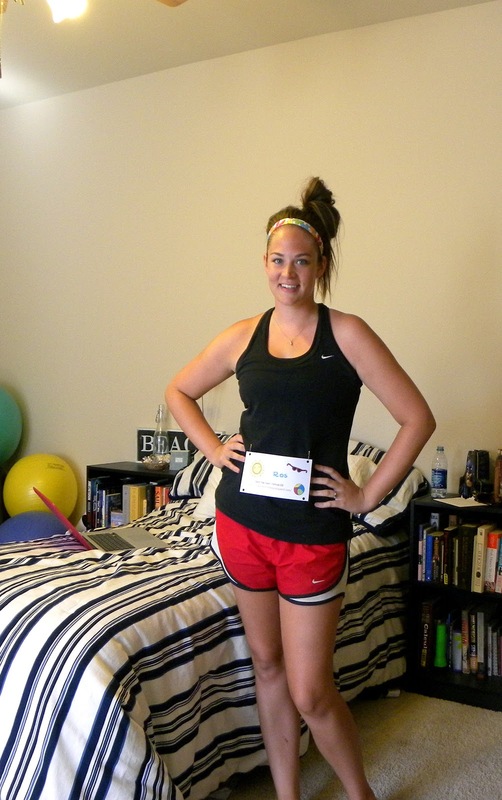 Then, Kayla from Running through Life posted about her virtual 5k that same weekend. After my last virtual race that I hosted, Kayla emailed me about wanting to do one of her own, and I had been really excited for hers to come up. So that's how I ended up signed up for two races at the same time, and I decided to run one 5k and count it for both because it's too darn hot here. Both of the races had a heat-related theme and my run didn't fail at living up to those names. Here's the forecast for next week, which is supposed to be cooler than it has been, but you get the idea. After quite a bit of dragging my feet, I got ready and took my bib pics. I had a lot of fun running these races. I ran my 5k around my neighborhood and had a lot of firsts. First 5k without walking - I've never run a whole 5k before (without walking breaks), and for some reason I could last night. It felt amazing! First 5k in Vibrams - I tried running the 5k in my toe shoes last night and it felt pretty good. No aches or pains and I ran farther than usual. I will say they take more work than other shoes since they use other muscles, but I've heard this goes away before too long. I'm really falling in love with these shoes. When I bought them I thought I would only use them for very short training runs, and now I'm debating wearing them in my half marathons. After wearing these, regular running shoes feel so heavy and uncomfortable. First near-death running experience - I run at night in my neighborhood sometimes to avoid heat because my neighborhood is gated and there are virtually no cars around here at night... Until last night. A car came flying around the corner and almost hit me so I jumped off the road to get out of the way. BAD idea. I landed in a pile of pebbles and junk from some construction going on and got a rock in my shoe and the blisters to prove it. Oh well! First time using Runkeeper - I used the Runkeeper app on my iPhone last night (mostly because my Garmin wasn't charged). I liked the app a lot. It allows you to listen to your music and interrupts at predetermined intervals (I chose every 5 minutes) to provide you with your choice of data (I chose distance and average pace). I think my Garmin is probably much more accurate and it's a little easier to use because it's on your wrist and sweat doesn't affect your ability to touch buttons (like it does a touch screen) but it was also nice to have information automatically relayed to me and not have to look so much. Thanks guys for hosting these great races. It was a blast and I can't wait to hear how everyone else did! I love the Runkeeper app! Way to go running the entire thing!! That is so awesome!!! Ouch about the blisters! That sounds so painful. I hope those get better soon!!! Awesome Job!! Beat the Heat was my first virtual 5K. I found your link thorugh Kayla's blog. I am a new follower =) I have been reading some of your posts and I am in awe!!! AMAZING!!! YOU ROCK!!! I just found out that my daughter has asthma. She was really wanting to get into running but after having a breathing attack at her first 5K, it scared her. We are in the beginning stages of everything but I am hoping that I can learn new things from you. So thanks for sharing =) Your story is inspiring!!! PS I am running the Dinsey World Marathon in 2012 too =) It is my first marathon. I might see if I can find you on Daily Mile. Karen and Kayla- thanks! I still can't believe I managed to get rocks in those shoes (like seriously where could they get in?) but my blisters are going away! S - thank you so much! congrats on your first virtual race! I understand how scary attacks can be(for her and for you), but I'm sure she will be confident with dealing with things once you guys get used to it all. My two biggest tips for her are 1) run (or whatever you do) for you and no one else. don't worry about speed or time or anything like that. do it to make you feel better not to impress others and it will be so much easier (and easier not to get discouraged) and 2) drink hot water! i know that sounds like a crazy one, but if she starts coughing or wheezing immediately drink something warm. it warms and relaxes the airways so that she can breathe easier (often stopping an attack completely) and it forces her to breathe slowly which is really important during an attack. good luck with everything! Thanks for running! I'm sure you'll have loads of races coming up w/out any walking! thanks Adam! Can't wait till the next 5k! Nice job! It's been hot here, too, but not THAT hot. I'm always worried about cars running at night...seems like it would be easy to get complacent living in such a quiet area as you, so I'm glad you were able to get out of the way. Scary! Great race! Being a runner for a long time, I've discovered a good way to increase my endurance, muscle strength and make recovery time much shorter. I could never expect all those results from one nutritional supplement, but it really worked perfect for me. This supplement is Navy Seal Formula by Military Grade. Ordered it from h t t p: //amzn.to/Y0uraF. The result comes surprisingly quickly. Now I spend twice as much time in the gym as I used to and still feel great! I feel toned and energized like never before!